ALLFIE is joining forces with education unions, students and other campaign groups for a national day of action against Disability Discrimination in Education. Our focus is on raising MPs’ awareness of the injustices faced by Disabled students when attempting to access mainstream education. Since the Conservatives came to power in 2010, we have seen increasing attacks on inclusive education with new legislation and policies that have weakened Disabled students’ right to mainstream education. At the same time, education providers are being financially penalised for promoting inclusive education practices and disincentivised by academic performance measures. From ALLFIE’s experience, the overwhelming majority of MPs lack any real understanding or appreciation of just how severe the injustices experienced by Disabled students in mainstream education are. 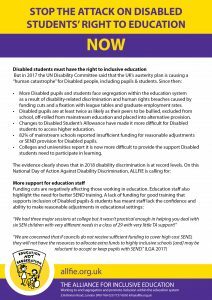 This is our chance to put the record straight: disablism and disability-related discrimination is rife in our education system and it needs to end. We need you to tell your MP about your experiences of the education system – what works and what doesn’t work. We need to use the power of social media to get the message out to the general public; we need to highlight the widespread disability discrimination that takes place in education on a daily basis. Schools sending Disabled children with autism home because there isn’t the right support in place. Schools placing Disabled pupils into Alternative Provision because they believe those pupils will harm the school’s GCSE results. FE colleges only offering Disabled students with learning difficulties segregated life skills courses because college tutors can’t or won’t make mainstream courses fully inclusive to all students. Universities refusing to make reasonable adjustments for Disabled students. Education providers refusing to follow inclusive design principles when refurbishing their premises. The Education Select Committee is currently undertaking a SEND inquiry. Whilst the inquiry’s terms of reference focus on the SEND assessment and EHCP processes and operations, ALLFIE decided to put forward a submission highlighting (1) how the government systematically violates Disabled students’ human right to mainstream education and (2) the failure of current education legislation to promote the presumption of mainstream education. We are pleased that Tara Flood, ALLFIE’s Director, has been asked to provide oral evidence to the Education Select Committee on the 20th November 2018. The Education Select Committee has a Twitter feed, so please tweet your messages of support for the right to mainstream education to @CommonsEd, including @allfieuk and @DamianHinds. We need you to act and bring the issue of disability-related discrimination to the forefront of the minds of the government, the Department for Education and MPs. On the 21st November we will be using the power of social media to tell Damian Hinds and the Department for Education about the widespread disability-related discrimination that thousands of Disabled students experience across the country every day. Please feel free to write your own tweet beginning with “#DisabilityDiscriminationinEducation is…” adding in @DamianHinds @educationgovuk – don’t forget to include us – @allfieuk. If you are planning to hold any activity on the day, let us know and we can promote it on social media.